A new really nice 2nd Cup coffee shop just opened in Orleans at 10th line and Charlemagne. It is upscale and comfortable with lots of seating and an outdoor patio to use on sunny warm days. There are cozy little nooks to use while reading a book or to enjoy the company of a friend. There is a fire place, lots of seats and of course WiFi. It did not take long for the computer users to try it out. When we were there at this shop, several had already planted themselves and were using the WiFi to work or just browse the internet. We actually dislike this of course because they take all of the good seats and they are there for hours. These people must not have internet access at home because you see them at all of the coffee shops where there is free WiFi. There is also lots of parking and it is one of the few 2nd cup coffee shops with a drive through for cars. Most 2nd Cup coffee shops do not have a drive through, although this is very popular in our particular area. 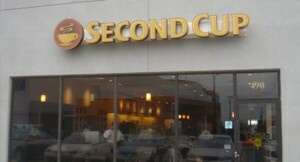 The other nice point about this particular Second Cup coffee shop is it’s location. Although it is part of a small shopping mall, it is in the middle of suburbia where consumers can actually walk to the coffee shop to get a cup of coffee when they are out for a stroll. With the drive through it also is ideal for those people who are on their way to work and looking to pick up a quick coffee to sip on while stuck in traffic. There are other competing coffee shops in the neighborhood, however this one is by far the best with its ambiance and comfort which many of the others simply do not have. This is the view I have sitting at the Starbucks Cathedral City location in the mornings! Mountains , palm trees, warm comfortable temperatures and a good cup of coffee. What more could you want? The sky is a deep blue color with no humidity and no dust in the air. The birds are singing and I just spent an hour riding my mountain bike to get to this location to sit down and enjoy my coffee and also a bagel! 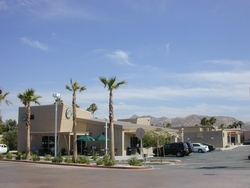 For your information, this particular Starbucks is located along highway 111 that runs the length of the Coachella valley through all of the valley cities including Palm Springs. This is the same route that the recent AGM Tour of California took on its way to Palm Springs and the Tram road. Fortunately for me the temperatures are in the low 60’s at the moment which is ideal for riding your bike. For the tour, they had to deal with 108F and riding up the Tram road for the last 2 miles is a killer with the heat and the elevation rise of over 2000 feet. However I am digressing. This particular Starbucks faces east at the front of the store and west at the back of the store, so you always have a choice between sitting in the sun or shade depending on the time of day. At the back of the store which faces 111, they have a few tables, umbrellas and a comfortable area to enjoy your coffee. Same with the front area of the store, however it is slightly smaller and faces the parking lot. We have met for coffee many times at the Café Latte Cino on tenth line in Orleans. It is located at 2020 Tenth Line Rd, unit 2 , Orleans, ON, K4A 4X4. It is in the same parking lot as CAA and Farmboy. This is the south west corner of tenth line and Innes road. Cafe Latte Cino, opened its doors in late 2006 and offers a variety of coffees and light meals sure to satisfy every taste. Beside the high end coffees, they also offer homemade soup, salads, and sandwiches, Fresh juices and smoothies, a selection of cakes, and of course Italian Gelato. Customers can also take advantage of free internet in a relaxing environment. This is a great coffee shop, always clean, dishes always removed and tables cleaned as soon as patrons leave. There are a group of comfortable padded chairs for groups of four as well as the standard tables and chairs. There is lots of room, unlike other coffee shops were everyone is crowded into a small space. The Café Latte Cino also has free WiFi available which has always worked every time we have been there. There is also lots of parking although it is shared with several other businesses in this mall. We especially enjoy the south facing windows which provide a bright environment and warm sunshine in the winter and early mornings. If the sun is too hot, just bring down the shades. The food has always been excellent, the selection is actually quite good for this type of coffee shop and prepared individually by the waitress. The coffee is fresh and there are a large variety of coffees to chose from. A really nice service that they provide is that they fill the coffee cup with hot water, to warm up the cup before filling with coffee. This way your coffee stays hot longer in your china coffee cup. They have recently added a loyalty card which provides you with a free coffee after you add 20 points to your card, through the purchase of food or coffee. All in all this is a great place to have coffee. It is more expensive than Tim Hortons or Second cup but then you are receiving better service and nicer surroundings than Tim Hortons. Second Cup for my money now has the best environment to sit and enjoy a great cup of coffee. 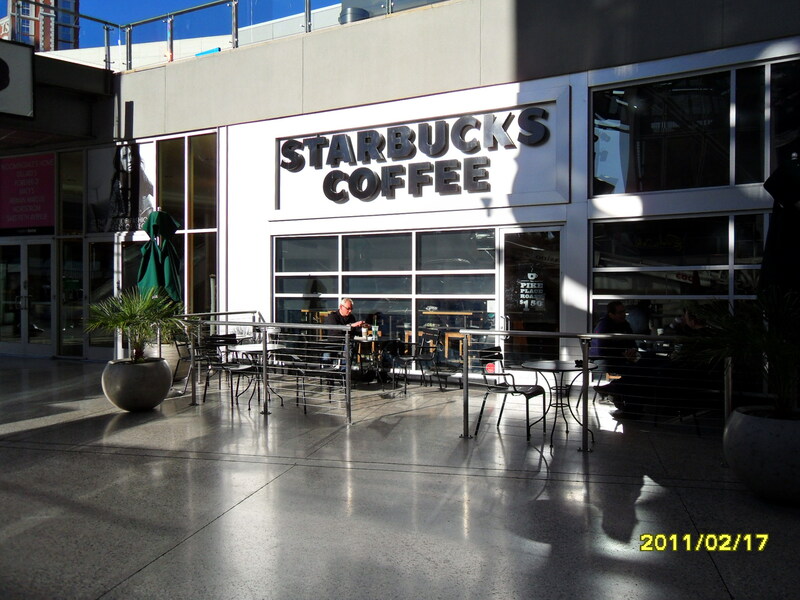 We visited the Starbucks at the Aquarius hotel in Laughlin Nevada on the Colorado river. It has changed to the Duet, run by the Aquarius casino. The Aquarius is one of nine casino hotels in this area and our favorite as far as casinos in Laughlin are concerned. If you would like to read more about the Aquarius, click here. The Aquarius is the old Flamingo Hotel which was purchased a few years ago. We will also be adding post about the Laughlin area and also about Bullhead , Arizona which is just across the river from Laughlin, so stay tuned. Starbucks has been replaced by the Aquarius hotel’s own coffee shop, called the Duet. It operates the same way, with free WiFi and 10% discount for those people with a slot card. It is much nicer than Starbucks and is kept pretty clean compared to Starbucks. All in all a good place to spend some time doing your email etc. This post is all about the Starbucks at this location. Regarding the menu, it is much the same as many other Starbucks, however you should be warned about the prices. We have been paying $1.50 for a tall Pike roast cup of coffee, while at this location, the same coffee is over $2.00 and you have to pay for refills even if you have a registered Starbucks card. They will give you 10% off if you have an Aquarius slot card. Refills cost fifty four cents. One of the nice things about this location, is that there are lots of places to sit and enjoy your coffee or read your email. Like most Starbucks, they provide free WiFi as well. In fact I have been sitting in the casino, not to far away and was still able to review my email and surf the net. There are also lots of wall plugs to plug in your lap top, which is unusual for many coffee places. They open at 6am in the morning, and close around 11pm. Too bad they are not open 24 hours, since the casino is open all of that time. For more reviews about coffee shops, click here. 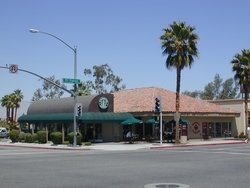 This particular Starbucks – Cathedral City location is quite close to Palm Springs and is located on Hwy 111 at Canyon Plaza in Cathedral City. There is a Target and a Trader Joe’s in the same plaza so it makes it a great place to stop, do some shopping and then have a coffee before heading home. There is also a drive through if you are limited for time. This Starbucks location has a shaded outdoor area at the back of the store which actually faces onto Highway 111. It can be a bit noisy at times, however it is a really nice spot to sit, enjoy the sunshine, and gaze at the mountains in the west. The only real negative about this location is the occasional noise from the highway and the occasional homeless person who takes advantage of one of the comfortable seats for a snooze. We only saw this once, but it really does not lend itself to an enjoyable relaxing coffee. Most of the time it is a really nice spot to relax and enjoy a cup of coffee. If you have never gone to Trader Joe’s it is definitely worth the stop. This is a relatively small grocery store with all of the basics at great prices. You can pretty much get everything that you need here unless you are looking for something special. They also have a great selection of wines and liquor at very competitive prices. They are known for the 2 buck chuck, which is a local California wine that is priced at $2 a bottle. Now I would not normally write about wine, however there is a story about this wine that I just have to tell. Most people will not admit that they drink $2 wine, after all how could it be any good? Well it seems many people drink it and serve it without anyone knowing. My daughter and son in-law would not drink it and even made fun of me for buying it and drinking it. They preferred to pay $12 for a bottle of wine which is a lot in California. When we got home we each opened our bottle of wine and made fun of each other of course. Well it turns out that they could not even drink their wine it was so bad. They were forced to try mine and what do you know, they actually liked it. They drank 2 buck chuck for the rest of their vacation! Comments on Starbucks or Trader Joe’s are welcome. Strongly recommend that if you are in the Palm Springs area, to take in Trader Joe’s and their wine. There are two Starbucks coffee shops in the Mall. One is located on the strip right across the street from the Wynn Hotel and Casino, while the other is located inside the fashion view mall catering to shoppers and tourists who are taking some time out from the casinos. Both Starbucks locations have the usual coffees and pastries following the cookie cutter design that you will find across the country. The Starbucks location on the strip is part of the mall. It has limited indoor seating as well as a small patio area with umbrellas. Patrons can sit outside and enjoy the early morning sunshine. They can watch people going to work or jogging by on the strip. The only negative that we found with this location is that the mall is continually playing music that is just a bit too loud for us. It repeats as well so if you stay for a reasonable length of time you are going to hear the same song a couple of times. What you will find unique about this Starbucks location is that there basic coffee is less expensive that any coffee you will purchase inside the Hotels on the strip. They all have coffee shops somewhere in the casino. And they charge an arm and a leg for their coffees and their pastries. If you are staying anywhere close to the Starbucks in the mall, it is definitely worth the trip over to buy your coffee. In addition to less expensive coffee, you also receive the standard free WiFi at this location and if you use a Starbucks card that is registered, the refills are free for regular coffees. Now that is a much better deal than what you will get from any of the hotel coffee shops. All of the hotels are huge and Wynn is no different, neither is Treasure Island Casino, which is also just across the street from the Fashion View Mall. At this location there are cross walk bridges including escalators for pedestrians to cross the Las Vegas Strip and Spring Mountain road. These are very busy streets with approximately 3 lanes of traffic in each direction. You can only use these bridges to get across the street and it is not only safer but it also saves time in that you do not have to wait for cross walks. By the time you leave your room, walk to the elevator and out to the strip, you probably have already walked for 5 minutes. These hotels are so large that literally you can walk that long. Walking to Starbucks at these locations will take more time since it is at least a 10 minutes walk from your hotel room, even if it is only across the street, but look at the morning exercise you get. We used this Starbucks every morning while staying at the Wynn hotel across the street. Check out our posts about the Wynn Casino as well along with some pictures we included. Comments are welcome about Starbucks or the mall. Spam comments will be auto deleted. 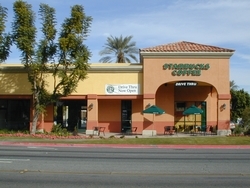 This Starbucks Palm Springs is right at the corner of Sunrise road and Ramon and occupies one corner of a small mall with a Ralph’s grocery store, dry cleaners and several other small stores. They even have a drive though which we have not seen a lot of at any of the Starbucks that we go to. They also have a nice patio with umbrellas as well as part of the building provides some shelter from the noon day sun. The only negative about this particular Starbucks is that several transients will hang out on the Sunrise side of the building among the cacti landscaping. They have never caused us a problem, but they do tend to make one less willing to go to this particular Starbucks. Apparently there is nothing the store can do since these guys stay on public property and as a rule do not bother the customers. The patio is in the shade in the morning and then gets the full sun during the afternoon. It can get a little hot in the summer time when sitting in this area. They also have free WiFi and are part of the corporate system that provides free coffee refills when you have a registered Starbucks card. There is lots of parking since they are part of the parking lot for the grocery store and the dry cleaners. Many people will go to enjoy a cup of coffee in the morning and then go on to do their grocery shopping at Ralph’s, the grocery store and then head home. It is also an excellent location since it is at the intersection of two busy roads, but still has easy access and lots of parking. Comments are appreciated about this Starbucks coffee location. Spam comments will be auto deleted. For more posts about coffee shops, click here. We love to visit Starbucks Palm Springs almost every morning. besides the coffee which is great. This particular location was at the corner of Tahquitz and Palm Canyon drive at the center of Palm Springs were you can sit outside and watch the world go by. Starbucks has opened a new coffee shop shown in the picture above. We have not been there yet, but look forward to visiting it soon. This is a traditional Starbucks with a few seats inside along the window and a few chairs to sit at. Outside there is a large patio with covered umbrellas to provide shade from the sun right on the corner. Many people go there every morning to meet people, to read the paper or just to people watch. Folks who are on their way to work stop for coffee along with the many tourists who are in town and especially the snow birds who love to spend there mornings with a great cup of coffee. If this sounds like an ad for Starbucks in Palm Springs it is not meant to, however we do spend a lot of time their and really do enjoy the mornings over a good cup of coffee. The picture we have included is not one of the best. We will replace it soon with a better one without the store in the shadows.Starbucks provides free WiFi for all visitors and now you do not need to sign in. Just agree to the terms and conditions and you are good to go on the internet. Across the street is another coffee shop called the Coffee Bean. It also occupies a prime location with tables and chairs located on the corner and along Tahquitz road under umbrellas as well as a small overhang. For those of you who may not be aware, when the sun gets hot, you really welcome those umbrellas to protect you from that burning sun. They also provide free WiFi, although you must get an access code by going inside and finding the code number on the TV screen on the bottom right hand corner. They have a small seating area and a fireplace for those cooler days. We like both locations and will move from one to the other based on how we feel that day. Starbucks is a little cheaper than the Coffee Bean and Starbucks offers free refills for people with registered Starbucks cards. Both locations suffer from time to time from transients coming by and asking for money or handouts. There are also a few people who buy coffee, but are of questionable character and sometimes will make guests a bit nervous. This does not happen often, but it does happen. If you have comments on either location, please feel free to leave comments. Spam comments will be auto deleted. For more reviews of coffee shops we like to go to, click here. 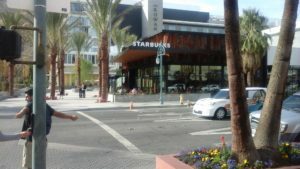 The Starbucks at the corner of El Paseo & San Pablo, in Palm Desert is an excellent place to spend some time enjoying the desert sun and watching people, reading or in conversation with friends. This El Paseo Palm Desert is right on the corner, the patio area is fairly large and is in the shade in the morning, and full sun from around 11 until sunset. There are lots of umbrellas as well so you can get in the shade if that is your preference. This Starbucks also has a fairly large seating area inside if it is just too hot for you outside, or if all the seats on the patio are already taken. We find that it is a great place to relax and enjoy the surroundings. 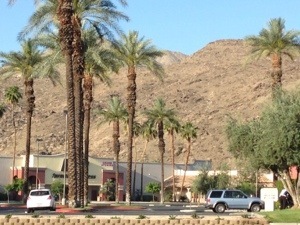 This El Paseo Palm Desert, like many of them provide free WiFi connections and also free refills if you have a registered Starbucks card. Well worth the time it takes to register your card. For those of you who may not know, El Paseo is the Rodeo drive of the desert. There are many high end stores and shops in approximately 6 blocks which cater to very specific tastes. They have very high quality and of course very high prices as well. You will see more BMW’s, Mercedes, Jag’s and even Bentleys driving along the street. There are a large number of expensive cars and also golf carts. It is not un-common to see someone going up and down the street in their replica golf cart. They may look like a Mercedes or some other vehicle. There is also several carts that will transport you from one end of the street to other end , all free of course. We have not used this service, however you probably should leave a tip for the driver. They are older seniors, mainly women who drive these vehicles. This is a great place to shop as well as people watch if you are into that sport as well. You may see famous people occasionally along the street and certainly many people who are very well off. Feel free to leave your comments about this Starbucks or the El Paseo area. Spam comments will be auto deleted. 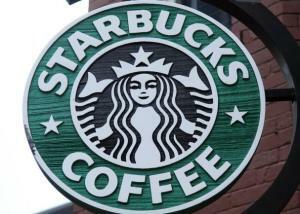 For more Starbucks locations in the Palm Springs area, click here. Roasted Bean at the Beau Rivage casino in Biloxi! Coffee at the Roasted Bean at the Beau Rivage casino in Biloxi! Fresh coffee under a glass canopy with shrubs and trees around you, background music and free WiFi. Wait it gets better, although the first coffee is expensive, as long as you have your receipt, all of your refills are free for the rest of the day! For a large coffee you are going to pay $3.85, which is one of the most expensive around, surpassing even Starbucks. However all you need to do is show your receipt and you can get a free refill any time that day. So if you are a coffee lover, then after even a 2nd cup of coffee you are starting to get to a reasonable price for coffee. The Roasted Bean coffee shop is better than any coffee shop we have been in, including Starbucks! Muted earth tones decor, open to the atrium above, it is an enjoyable place to sit and savor your morning coffee. It can get a bit crowded at times, especially if the hotel is full, however most people only stay for a few minutes and they are on to their conference, the pool or to the casino. All of the chairs are padded and they have invested in easy to clean marble tables. None of these short stay uncomfortable non cushion chairs which make you want to leave at the Roasted Bean coffee shop. And the place is clean, which says a lot about the management. On nice warm days in Biloxi, you can also go outside and enjoy the warm air on the patio while you enjoy your coffee. The Roasted Bean has solid tables and chairs with umbrellas for patrons to sit and enjoy their coffee! All in all the Roasted Bean coffee shop is one that we enjoy going back to! 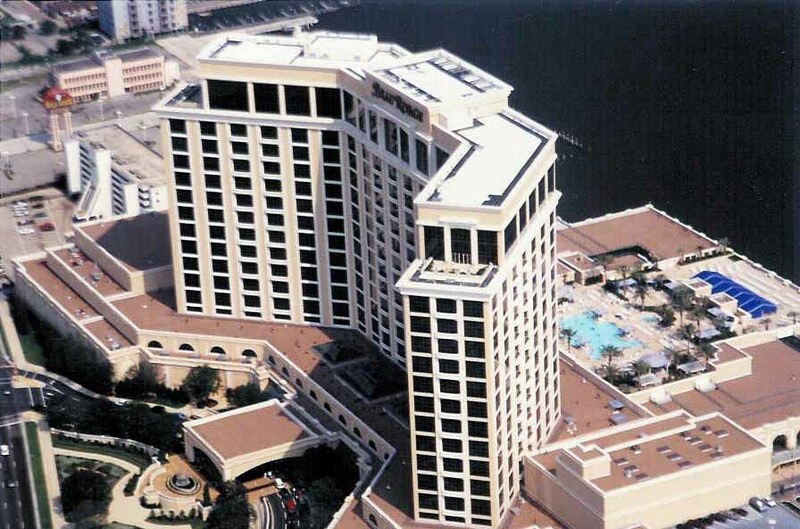 This is one of the features that keeps us coming back to the Beau Rivage Casino and Hotel. The only negative thing about the Roasted Bean coffee place is that there are not enough wall plugs to plug-in your computer. I could only find two. I guess they really do not want you to stay too long working on your computer. This is really not a coffee shop, but I have slotted it into this category since we purchased coffee at the Esso Station that is combined with a Tim Hortons coffee service. We had to fill up for gas at the local Esso station at the corner of Jean D’arc and St Joseph in Orleans. True to fashion this is one of the most unfriendly places I have ever gone to. It was 5:30 in the morning and I will give the guy some slack, he probably has been on duty all night, and maybe just about ready to finish his shift. Still, he could have said good morning! It got much worse. I am trying to fill my car with gas and ran my credit card through the reader on the pump, selected the grade and placed the spout in the gas tank intake. It is -17C and I am waiting for the attendant to activate the pump. They have to do that even though the customer does everything else. He was busy with a customer providing coffee , so long that the pump reset itself and I had to enter my card again. It was really cold, so I entered my card and knocked on the window to get his attention this time. Once I filled my car I went into buy a coffee. He did not say good morning, but did say it would be a few minutes, because he had to make another fresh pot of coffee. No problem, fresh coffee is always good at that time of the morning. Tim Hortons coffee is one of the best when it is really fresh. So myself and two other customers are waiting for the pot to fill, he is doing his end of shift accounting and I said to him I think the pot is going to over flow. It was as if I had not said a word. I looked at the other customer who shrugged, and then I said the pot is overflowing because by this time so much water came out that it was running all over. He still did not move so I said it is going all over the place, and he finally walked over and stuck another pot under the drip to catch the rest. Not a word of thanks or what a mess or anything. He prepared the other customers coffee who was there before me and then he asked me what I wanted and gave me my coffee. Talk about someone who either does not like his job or who was in a bad mood. This is typically Tim Hortons these days and typically Canadian. Canadians are getting a reputation as being an unfriendly lot. We have found a lot of the Tim Hortons shops unfriendly due to the kids that work there. We recently had coffee at the Starbucks located inside the Chapters store at 2401 City Park Drive, Gloucester, ON K1J 1G1, which is actually in Ottawa near the corner of Blair road and Olgivy Rd. This Starbucks & Chapters store is a very busy store both for books as well as for coffee. On any given day it is difficult to find a place to sit. Many of the Starbucks locations seem to be like this. Starbucks is also upgrading many of their busy locations. A big improvement in the opinion of this customer. This is a nice combination of located a great coffee shop with a Chapters store. Many people were browsing books while enjoying a coffee. We have to assume that the books had been paid for and not borrowed. As with many of the Starbucks it has a decidedly American flavor to it. The staff is friendly and helpful and they have a full selection of all of the standard coffees etc. This is a high traffic location and there was a bit of slush in the parking lot so that a lot gets tracked into the store which is a bit of a negative. As we said the staff was friendly and actually said hello to us first before asking for our order. This is something a lot of Canadian companies still have to learn. Besides belong located inside a Chapters book store which is a decided advantage, there are also a lot of tables and chairs for people to relax and enjoy their coffee and a snack. The WiFi was also working and there were a number of people working on their laptops while have a coffee. I checked the connection using my iPod and found that it connected quickly and had a reasonable speed. Many people go there for several hours to do their email, work on a project or study for exams. This puts seating at a premium, which can be a bit of an issue if you want to settle down with your favorite coffee and read a book.. I would definitely go back to this particular Starbucks! The hours of this particular store coincide with that of Chapters since there is no physical separation between the two. As a result if the Starbucks is open the Chapters book store much also be open as well. There is also lots of parking outside with a Best Buy and the theater nearby. On days when there are a lot of people going to the show it can get a little busy in the parking lot as well. Starbucks Orleans is part of an American company expanding into Canada and this location demonstrates a little bit of the American influence. Starbucks Orleans cannot quite shake off that cold unfriendly Canadian influence that Canadians are increasingly being known for. This location is always really busy (they need a third Starbucks somewhere in Orleans, Ontario) and crowded. Often there is a line almost out the door to place your order and another line waiting for the specialty coffee orders to be prepared. At busy times you might have to wait up to 10 or 15 minutes in total for the special cup of java. The staff is professional and they do say ” Can I help you” with a smile, however that is about as far as it goes. I think they are so busy they are just trying to get the orders completed, which is not a bad thing. Still it does not measure up to what we have experienced at coffee shops in the US at Starbucks. Since this location is so small, they really do not have a good location to store supplies. As a result they have boxes piled up in customer areas and they sometimes even place them on the counter were people sometimes sit if there are no boxes to enjoy their coffee. My daughter who is a food auditor for the airlines mentioned that this is a really bad infraction from a cleanliness perspective. Who knows were the bottom of that box has been, now it is on the counter and leaving who knows what on the counter were people site and enjoy food as well as coffee. She spoke to them about it, however of course no one did anything about it. They have a couple of sofa chairs, about 5 tables and a bench area, all really crowded together. This place is always really crowded and seldom do we go there when we do not have to line up for a coffee and then line up for a specialty coffee to be made. This place is a real gold mine, but they have to get more space for people to sit at. The place is popular since everyone goes for the coffee! They also have free WiFi. We also registered our Starbucks card so we get free refills and free toppings if we order a specialty coffee. We also get a free drink of our choice on our birthdays! Even with the friendliness, the boxes and the relatively small space, we will continue to frequent this Starbucks although the new Second Cup in Orleans is beckoning as preferred spot. As of June 7, 2016, this location is going to be remodeled. Can’t wait to see the changes. Are Canadians Friendly & Polite? We do not think so or maybe it is just the kids that work there. Yesterday we were at a Tim Hortons in Ottawa, Canada on Trim road near Waters street. Typical of most Tim Hortons it is one of the most unfriendly places to get your coffee. No one said good morning, no thank you or can I help you, Just “next”. Canada used to have the reputation of being friendly and polite. Not any more. Every time I experience this sort of thing I am going to post something on this blog about it. This is the first one and I will also post comments when I do receive friendly service! Aside from the unfriendly service, the shop was messy, the kids behind the counter were too busy talking to really provide good service and there is no WiFi for customers who want to check on the news and surf the net. Tim Hortons has recently updated their restaurants with WiFi. I guess they were finding that the competition was too much for them and customers were expressing frustration at no service. 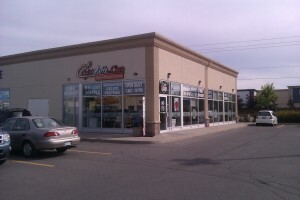 Tim Hortons is a really successful coffee shop chain in Canada, and try to move as many customers as possible through their store as fast as possible. They discourage anyone from really staying too long. Never the less if they do not provide great and friendly service, there is an opportunity for another chain to step in and under mind their business. We originally wrote this post in Dec 2010 and this update is two years later. Nothing has changed relative to customer service at this chain and in fact we have continued to notice a deterioration at many other places as well. Even McDonald’s is not consistent and is really depends on who is across the counter. Adults tend to provide better service than the teenagers who are too engrossed in their personal lives which are very trivial – music, the latest date or party etc. You have a job, you are lucky to have a job, so do it well or you risk losing it.